This time you're Lynch, and you've got online co-op. Kane & Lynch 2: Dog Days recently made the transition from rumored software to announced product, but details about the game have remained scarce, even on the game's official site. I found some, however, on an assets disc I recently received from Square Enix, and they present some good news for those who played the first game. The 2010 game switches the lead in the series, putting players in control of "self-medicated psychopath" Lynch. The story, according to the fact sheet, begins with Lynch having found peace in Shanghai and attempting to "make a fat deal where the pay is beyond his wildest dreams and nothing is going to get in his way." The plot summary promises that Lynch will find Shanghai to be the "perfect playground for expat criminals such as [himself]; seduction and corruption highlight the contrasts of the city as players fight through the seedy underbelly of Shanghai – a juxtaposition of old-world and new-world ideals ripe with black market opportunities for Kane and Lynch to exploit and reap rewards from." The game will support online co-op, in contrast to the original's inclusion only of offline co-op. Competitive online multiplayer will return. The fact sheet is light on gameplay details, though it does note that players who are shot to the ground in the new game will be able to shoot from a prone position or crawl away, giving them a second chance in the fight. 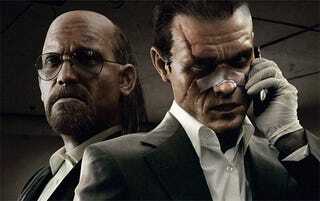 The game is in development at series creators Io Interactive. It is announced for a Q2 2010 launch on the PlayStation 3, Xbox 360 and PC.